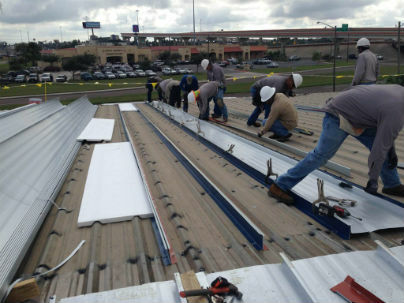 McElroy Metal has a patented 238T frameless Metal-Over-Metal recover option that provides a low cost recover solution over existing exposed fastened panels. 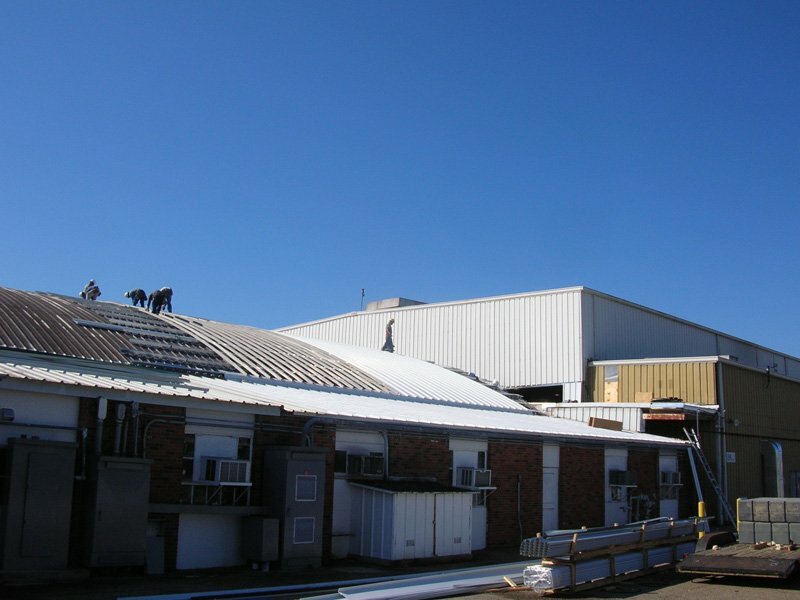 This system utilizes McElroy's easily repairable symmetrical 238T standing seam panel while providing a long-term solution to existing metal roofs that have completed their service life at a cost that is competitive with single-ply recover and will last two (2) to four (4) times longer. 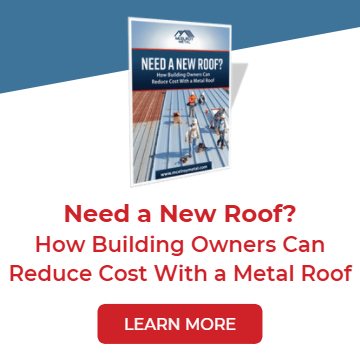 Recent articles and white papers have been published to inform and educate the marketplace about critical engineering considerations that must be made when considering single-ply recover over an existing metal roof. 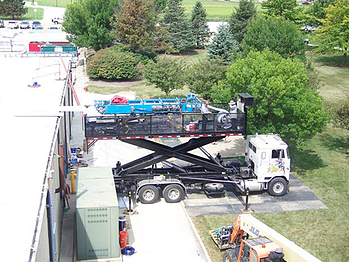 The thru-fastened recover system is designed to be installed over existing panels up to 1.5" tall, such as R-Panel. 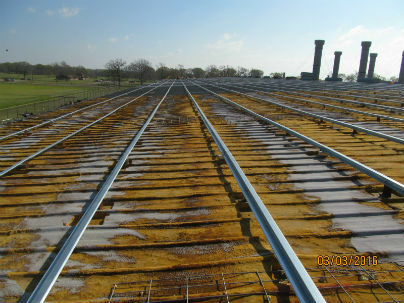 The system utilizes tall clips that sit between the ribs of the existing panel and are attached directly to the purlin below. 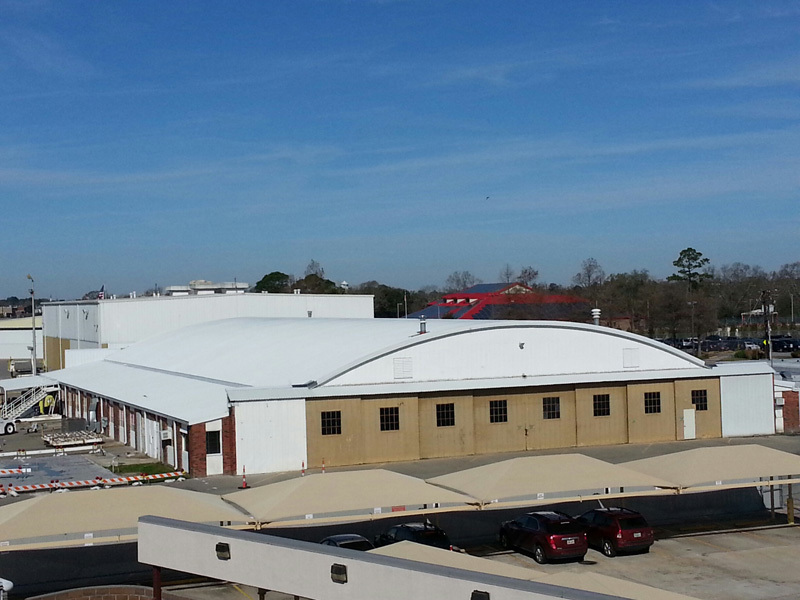 The air space between the two roofs is filled with insulation. 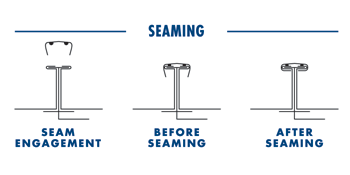 The images below show the steps of a 238T Metal-Over-Metal recover. 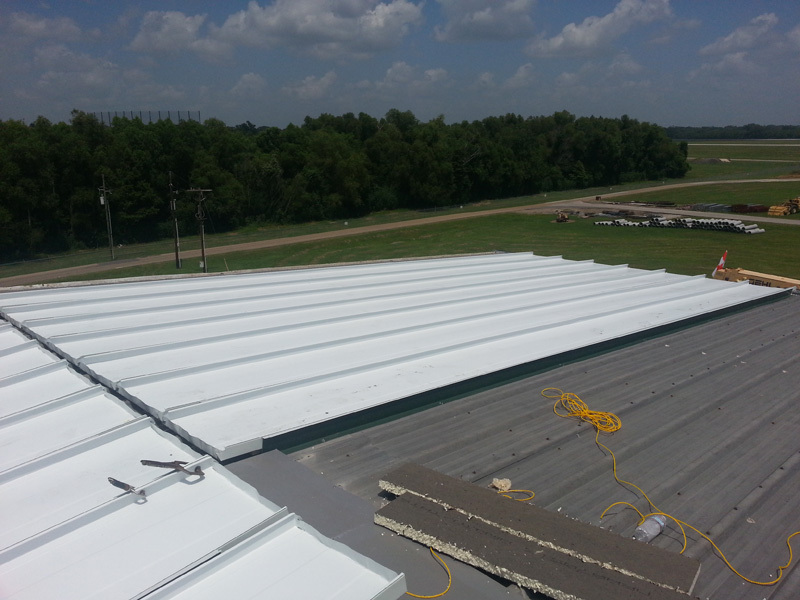 Utilizing McElroy's jobsite production vehicles, roof panels run from eave to ridge, eliminating the need for end laps. 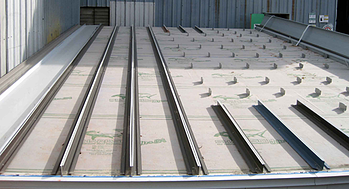 Single length panels offer labor savings and improve weathertightness. 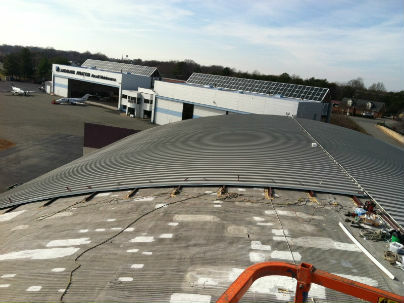 Once the panels are manufactured on the roof, then special die-cut insulation is placed over the existing roof panels. 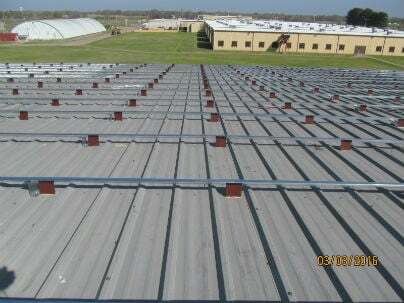 Seam caps are applied over adjoining 238T panels. Note the two beads of butyl sealant in the seam cap that improves weathertightness. 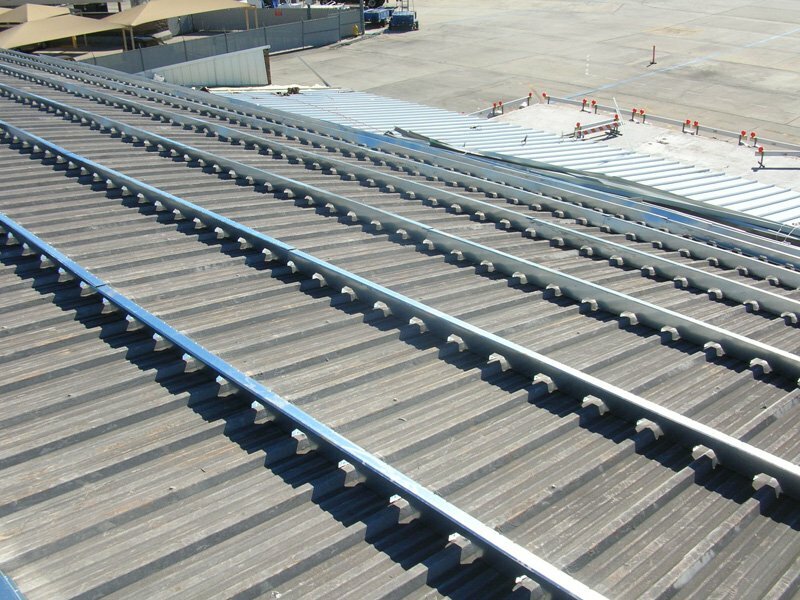 For maximum strength and load handling capabilities, Multi-Span clips can run from eave to ridge as shown on the left. 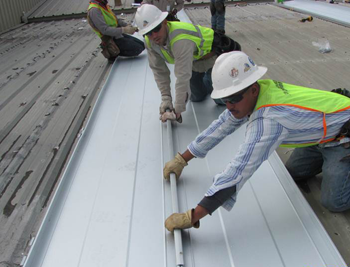 Multi-Span clips are often utilized in critical areas, such as corners, while standard clips are utilized for the majority of the roof. 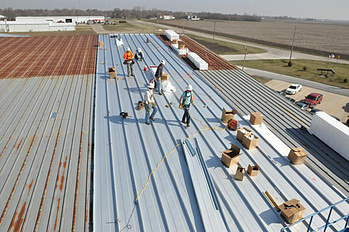 For high wind uplift or snow load area, McElroy's Multi-Span clip provides up to -93.5 psf allowable uplift or nearly 100 psf positive with a 24" wide panel installed over purlins 5' on center. 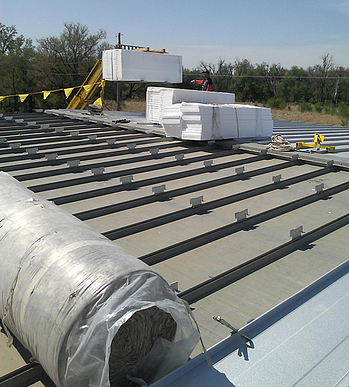 The second recover system is designed to go over an existing 3" tall trapezoidal standing seam. 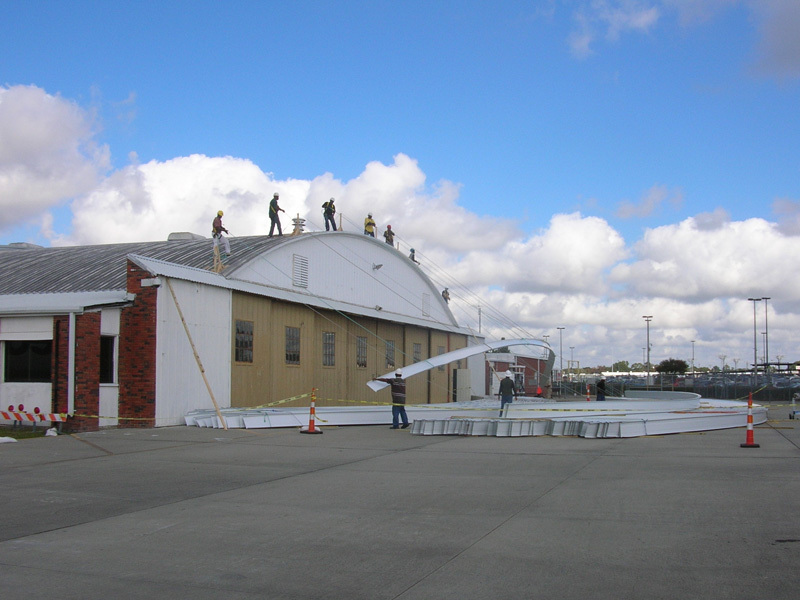 The basic process is to set the 238T retrofit clips on the shoulder of the trapezoidal panel over the purlin, then fasten sideways through the seam. 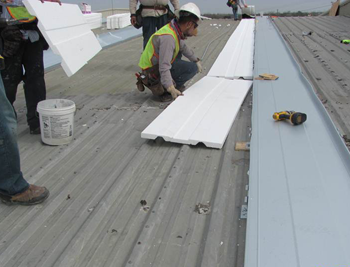 Once the clips are installed, the existing roof panels are fastened to the purlins, then insulation is added between the existing panel seams and the new panels are snapped into the clips. 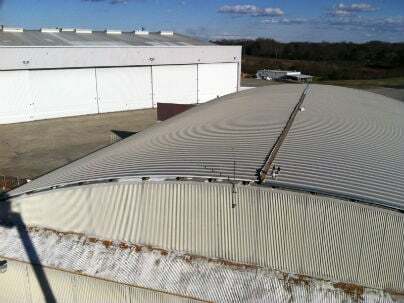 Wind load resistance can be increased up to 85.5 psf allowable over purlins 5' o.c. 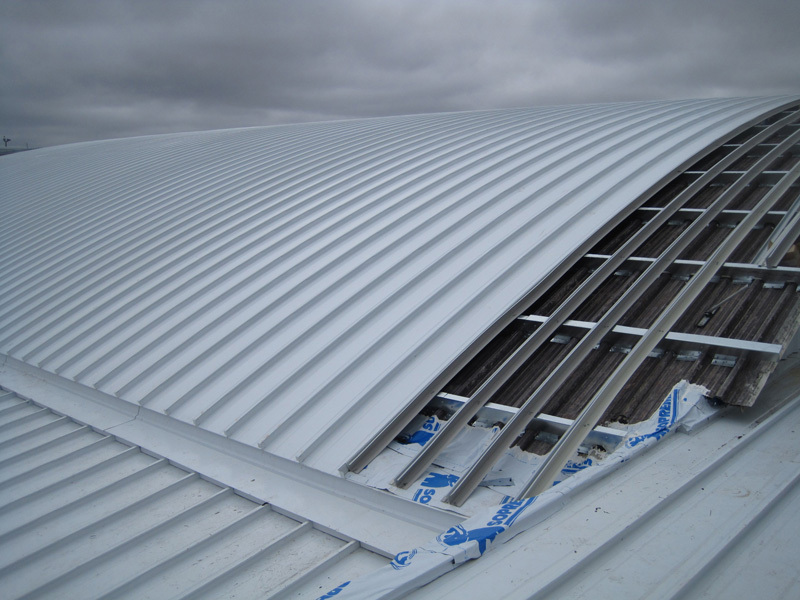 On the Trapedzoidal Recover system, the clips are pre-installed to the side of the seam right over the purlins as shown. 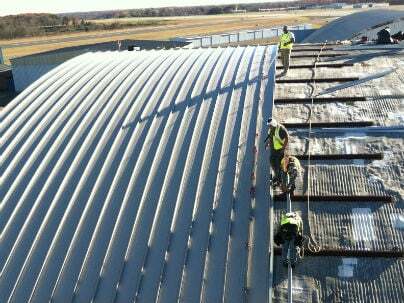 Later, the existing roof is screwed down into the purlins, 5" of insulation is added and the new 238T roof panels are snapped into the clips. Installation of this system is very efficient, resulting in low labor hours.